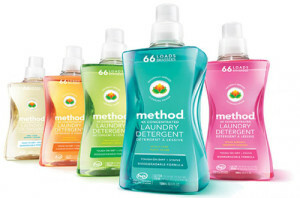 Method Products, an eco-friendly household, fabric, and personal care products manufacturer, has introduced its new 4X Concentrated Detergent product in a 53oz polyethylene terephthalate (PET) bottle made of 100% post-consumer recycled (PCR) resin from Amcor Rigid Plastics. As said, it is the industry’s first liquid laundry bottle made of 100% PCR PET. Up until now, PET has struggled to enter the liquid laundry detergent market due to compatibility and color stability issues. Initial testing on preforms and further stability testing done by Amcor revealed no such issues, according to Matt Lewis, Senior Development Engineer for Amcor Rigid Plastics. The transparent bottle for Method can be stretch blow molded without a handle. One challenge for the mold design is the cross corner parting line split and the highly functional ergonomic hand grips molded on the back side of the bottle. This was overcome by a variable radius parting line that allowed the part to release from the blow mold with no plastic entrapment. The neck design is another issue due to the two-piece polypropylene (PP) pour spout and cup closure engineered for an HDPE bottle. The pour spout required orientation to the front of the bottle and once in that location could not be rotated by the removal of the pour cup. As a result, the lug design on the neck is being tweaked for the optimal performance. In addition, a small adjustment was made to the bottle’s shoulder height to accommodate the filling process. Amcor’s ASSET life cycle assessment tool showed that by using 100% PCR resin, the package’s life cycle energy consumption is reduced by 78% and its carbon footprint is lowered by 35% versus a virgin PET alternative.